Photo: Orient-Express. Luxury Lake Titicaca Tours & Travel. It is said that the Sun God, Inti, created the first two Incas, Manco Capac and Mama Ocllo, by causing them to rise from the sacred waters of Lake Titicaca. He then commanded them to people the earth and to lead his chosen people in search of a more fertile land where they might settle and prosper. Our journey retraces their path, taking us from the green hills of Cusco, back in time through the harsh expanse which is the Altiplano, to the shores of the Great Lake. Shortly after the Spanish conquest, the great Inca capital of Cusco fell into decline, virtually abandoned in favour of the coastal city of Lima by the seafaring people who had stripped it of its wealth. Cusco's long isolation was ended by the arrival of the railway in 1908, an occurrence which enabled the region to begin to export its agricultural wealth to Bolivia and Argentina. Although condemned still to provincial obscurity by the rest of Peru, Cusqueños now found themselves reading the Buenos Aires newspaper "La Nacion", which took only eight days to arrive by rail from the Argentine capital, whereas Lima's "El Comercio" was already fifteen days old when unloaded in the Plaza de Armas by the mule drivers who had brought it across the Andes. From Cusco, nestled towards the western end of its well-watered valley at 3,310 metres above sea level, our train heads south-east, following the Huatanay River through green fields dotted with willow trees and eucalyptus groves, and passing outlying communities gathered around colonial churches that conceal their artistic treasures behind crumbling adobe facades. Twenty-five kilometres from Cusco we clatter through the station at Oropesa, an early-rising community whose forty-seven bakeries have provided Cusco with its daily bread for generations. Before reaching Lake Muina, the train turns to the left, crossing the valley road, to join the Vilcanota River at Huambutio (Km. 32) as it plunges sharply into its gorge before widening into the great Urubamba canyon. At Rumicolca (Km. 40), we are close to the great stone gateway of the same name which, for the Incas, silently guarded the southern approach to Cusco, and, for the much earlier Wari culture, served as an aqueduct, channelling water from the picturesque Laguna de Lucre to their walled city at Pikillacta. The church at Andahuaylillas (Km. 45) is, without a doubt, one of the jewels in Cusco's colonial crown. Known locally as the Sistine Chapel of the Americas, and devoid of all the baroque grandeur of Cusco's temples, which were built at least half a century later, Andahuaylillas's church of Saint Peter boasts a magnificent series of murals and superb colonial-era paintings, all on diverse religious themes designed to steer a recently-evangelised and illiterate peasantry closer to the new rulers' Christian god. There is another very fine colonial church at Huaro, a further 7 km down the line. The chilling effect of this temple's mural depicting hell is moderated somewhat by the floral motifs which adorn its ceiling, and a beautiful painting of the tree of life. At Urcos (Km. 59) lies the lake which gives the village its name. Urcos is both a popular spot for weekenders from Cusco and as local legend would have it -- the repository of Inca gold hidden there forever by local chieftains anxious to prevent the Spanish from melting down their sacred objects. Apparently indistinguishable from the many other small communities that surround them, the two villages of Cusipata (Km. 80) and Checacupe (Km. 99) in fact hide unexpected treasures of both pre-Columbian and colonial origin, from fine Inca and pre-Inca remains, to yet another ornately-decorated 17th century church. At Raqchi, some 120 kilometres from Cusco, just before the San Pedro railway station (Km. 123), the remains of the great temple of Viracocha, the creator god, can just be seen to the left of the train, dwarfing the local church like a colossal Roman aqueduct spanning a medieval European town. Raqchi has been described by John Hemming as "probably the largest roofed building ever built by the Incas", and Peter Frost calls it "a unique building in its day, a cathedral-sized space, with a tall central wall supporting the roofline, and a row of cylindrical columns on either side of the wall, giving extra support to the roof". Seventeen kilometres beyond San Pedro, the train grinds to a halt at Sicuani, a bustling island of commerce amid a barren landscape. Robust, bowler-hatted Aymara women ferry their goods around this important market town on nimbly-chauffeured taxi-tricycles, or sit impassively before their wares awaiting a buyer. At Marangani (Km. 186), where an English-style manor house built in the last century is still home to the descendents of the wool barons who established the regions only textile factory there more than one hundred years ago, Cusco's fertile hills finally give way to the high plain known as the Altiplano. This is a wild, high, windswept and sunburnt prairie of isolated communities of shepherds and cattle farmers, wedged between the two distant branches of the Andes visible occasionally on either horizon, when not melting completely with the giant cumulus clouds that dominate the skyline. 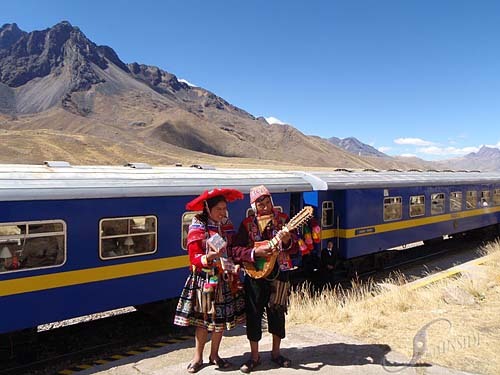 The train continues to climb for another twenty-seven kilometres, past the thermal baths at Aguas Calientes to La Raya, some 210 km from Puno. At 4,321 metres above sea level this is the highest point on our journey, a cold, remote place whose surrounding snow-draped peaks are often shrouded by mist or fine rain, and whose eerie silence is at least partly attributable to eardrums blocked by the dizzying altitude. Crossing this great watershed, and sensing the land fall away almost imperceptibly on the other side, the train's locomotive begins to gather speed, carrying us on across a sea of seemingly-endless coarse grassland, crowned by an even more immense sky, through villages lost to time for all but the Coca Cola company and local breweries, whose logos dominate their rain-battered, sun-baked main streets. At km 281 we reach Juliaca, a commercial railway-junction town of around 150,000 inhabitants, whose rampant buying and selling seems at times to virtually spill onto the tracks and force the train to pick its way through their stalls. Juliaca is our last stop on this journey through Andean highland culture before reaching Puno (3,855 metres), an expanding, low-roofed university town spread around an austere cathedral, which, since its foundation in 1668, has strengthened its tenuous grip on the shores of Lake Titicaca by gradually scaling the surrounding hills.